Happy Marshmallow Monday! 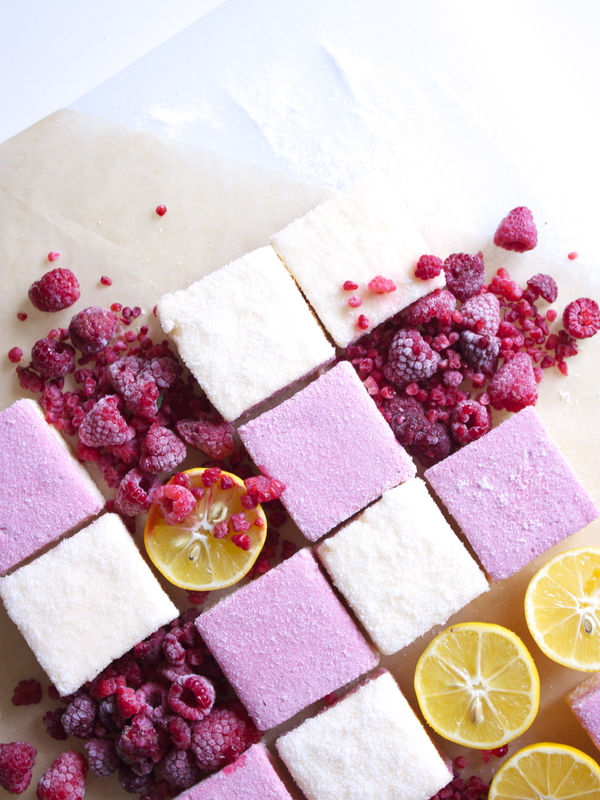 For this spring fever, Easter-ish edition, I used raspberry juice and juice from lemons to create double-decker mallows with a Peeps-style sugared finish. This flavor combo is so bright and juicy—dare I say, thirst-quenching? The tartness of the lemon pairs perfectly with the bold berry punch, making for quite the taste explosion. Just writing this right now is making my mouth water—gonna go get one from my freezer right this second. These really are super fantastic—you’ll love ’em! Heat raspberries in a saucepan on medium heat, mashing them with the back of a fork as you go. Continue this process for a few minutes until berries are completely mashed. Set a fine-mesh strainer in a bowl, and pour mashed raspberries through it. Use the back of a spoon to push the juice through. You’re after 1 cup of juice, but if you’re a little short, just add in a little cold water. Allow to cool before using. Juice lemons until you have 1 cup of juice. In a large mixing bowl, combine a 1/2 of a cup of juice with 3 packets of gelatin and allow to sit until gelatin forms, about 15 minutes. In a medium saucepan on medium heat, combine 2 cups of sugar and 1/2 of a cup of juice, then stir until sugar has dissolved—about 3 to 5 minutes. Increase heat to bring mixture to a low boil, and continue to boil until the temperature reaches 240 degrees F on a candy thermometer—about 12 to 15 minutes. Remove from heat. Pour the mixture into the pan (or in the pan on top of the first flavor if this is your second batch), smoothing the surface with a spatula. (Spray spatula with cooking spray as needed to keep it from sticking.) Let the marshmallow sit for about 6 hours, uncovered, until completely set. Cover a surface larger than the marshmallow slab with remaining sugar and flip the cake pan over so that marshmallow lands on the sugared surface. 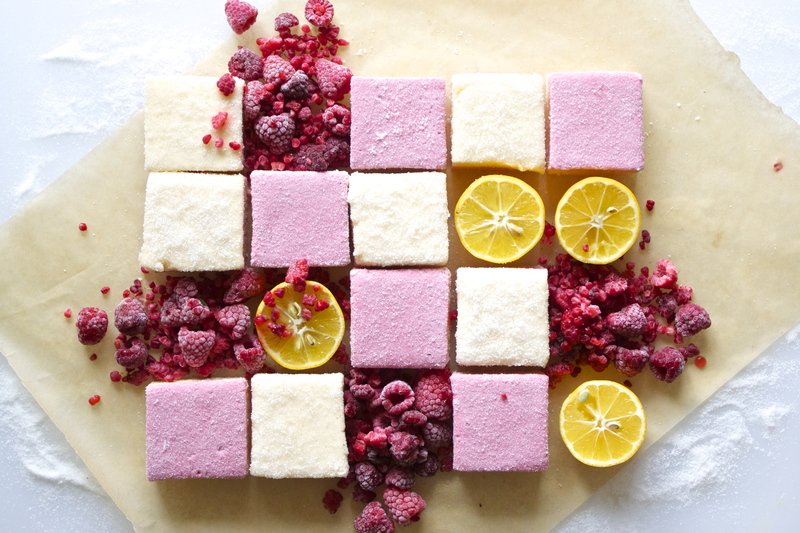 Cut marshmallows in whatever shapes you’d like, then press all sides into sugar so marshmallows are completely covered. 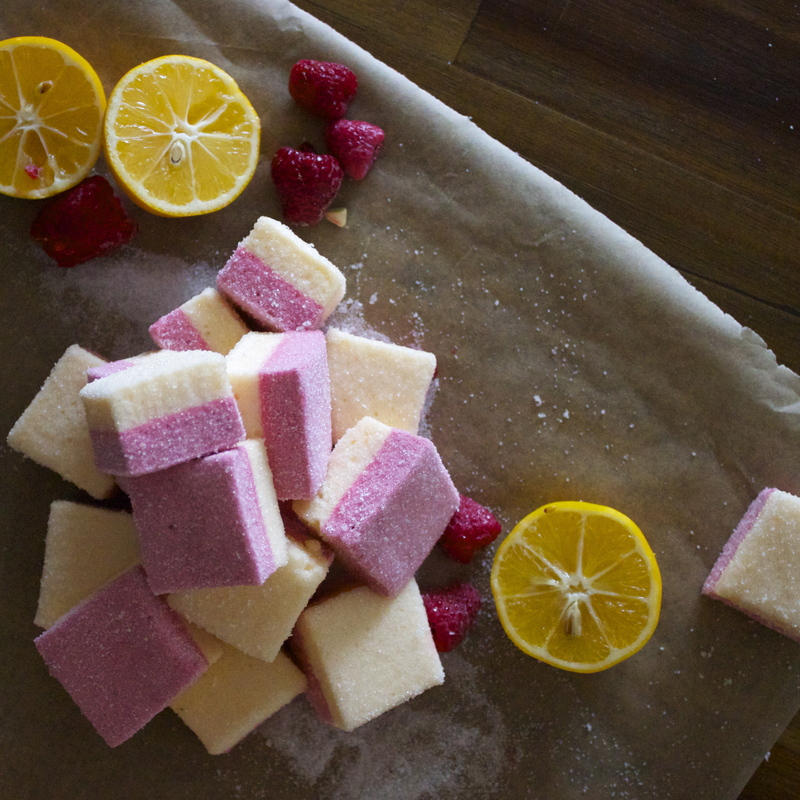 Check out my post on Marshmallow Tips for a little extra help. So, if they are in a Ziploc at room temp, they’ll be good for several days. I probably wouldn’t leave them out for more than a couple hours or they can dry out a bit. If you think you might need to for Easter, you might use corn syrup instead of all sugar (instead of 2 cups of sugar, use 1-1/2 cups of sugar and 1 cup of corn syrup in the saucepan on the stovetop). I don’t notice any difference in the taste, but the corn syrup version definitely doesn’t dry out nearly as fast–you’d probably have a good 3-4 hours with those. And yes, if you freeze them, I would say they’ll just a bit denser (still chewy though! ), and when you defrost them they get a little softer and should stay in pretty good shape. You might want to toss them in sugar again just to freshen them up. Hope this helps! And let me know if you have any other questions! Hope you like ’em–they’re totally my new favorites!